This part of the website only concentrates on Victor and other friends included in his activities. 18th June 2010: Dear friends keeping this section up to date has been an impossibility for me. Boxing and other issues of life was mainly to blame, I will make an effort in the coming days to keep you updated about whatever was important to me. I apologize for not looking after this website and this topic. This is due to loss of interest by me and finding time, I have partially turned my interests to the stock market, something I have unsuccessfully done in the past. The loss of interest is mainly because of negative reaction by some in the boxing fraternity and me being from a much earlier period than today's living fight followers. I have been getting myself fit by training at Frank Bianco's gym at Lower Templestowe displaying some old fashioned real boxing training. This is at the very end of Swanston Street off Templestowe Road, Lower Templestowe. We get there at about 5:00 pm. Young Victor's near loss of son Paul - This usually happens to other people and we just can't imagine it happening to us. Personal comment: 28th. April 2008. I was invited for an interview on Koori radio station to comment of the Bob Rose Cup night at Malvern last Thursday, myself and some of the old boxers on our time. I called the thread: "What a mouth"
I listened to what Lynette recorded from this and I couldn't believe how long I rattled on for, something like 18 minutes. I also noticed that I was on a train without stops, poor announcer Brad must have got an easy night as he didn't have time to talk. I am sure it didn't quite go the way the announcer Brad intended but my inexperience must'have been to blame. I hope I don't get used to it and grab Howard Lee's microphone at the next fight meeting and perform. Anyway all in all, its inexperience I suppose. 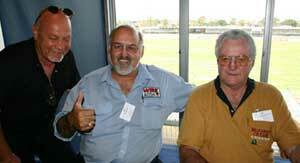 You were fantastic on our show on Monday and myself Brad and Claude are big fans. Remember a guest can never talk too much particularly with the amount of stories and memories you have. We will definitely do round 2 later in the year. Held at The Grand United Cricket Club at J R Parsons Reserve. 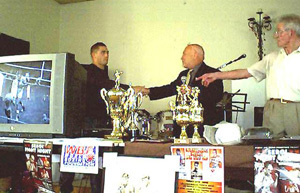 Bryan Membrey presenting the Reg Undy Best Ringside Personality Award 2007 to YV. A very touching expression on Bryan. 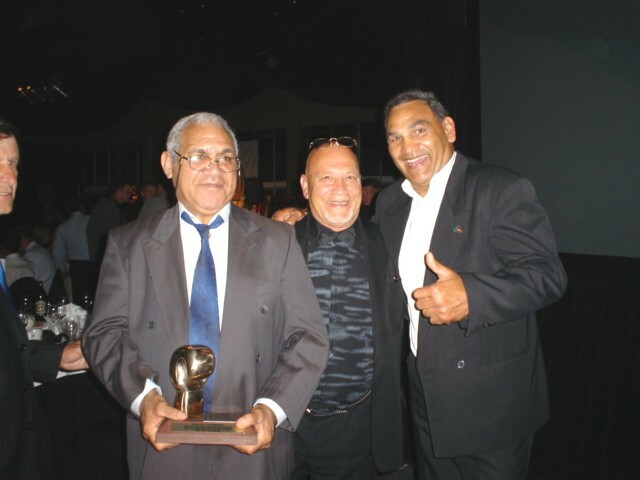 THE HANK STANLEY VICTORIAN BOXING AWARDS 2007 was resurrected by Keith Ellis with the help of Damian Membrey to keep alive a very old tradition as Hank has been ill of late. 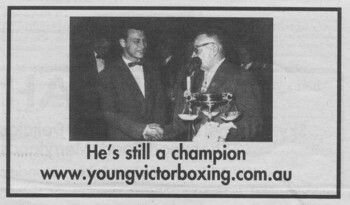 YV thanks the Victorian Boxing Trainers League and appreciates the nice gesture by all that form the committee. Naming someone a Champion is no insult especially when done as a gesture, I suppose! In the recent World of Boxing journal this blocked photo appeared and has possibly turned up a few noses going by some of the feelings I am getting from some forum armchair comment makers. I have felt I needed to comment on it on my own website to get the records straight. This was done by my very nice and respected friend Ray Wheatley (editor of World of Boxing Journal) whom I recognize as one of the most knowledgeable men in Australian Boxing. Ray has done this as a gift in return for my advertising his paper on my website for some years now of my own accord. When Ray asked me what I wanted on it I decided to leave it up to him to put something that would advertise my YoungVictorBoxing website. He did this and good or bad I like it, I am prepared to back up anything Ray says and also prove him right. You can see Ray's advert for his journal just here to the left, click on his link and make sure you place an order for his paper which comes out once a month and is full of AUSSIE BOXING he even takes orders by email on line right from here on Young Victor Boxing and sent anywhere. 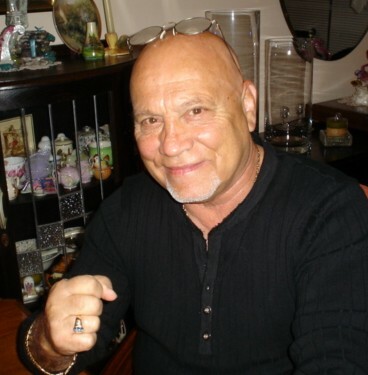 Thanks Ray with your 50 years in boxing and responsibilities, in my eyes you are the champion. Most of YV's old press clippings. 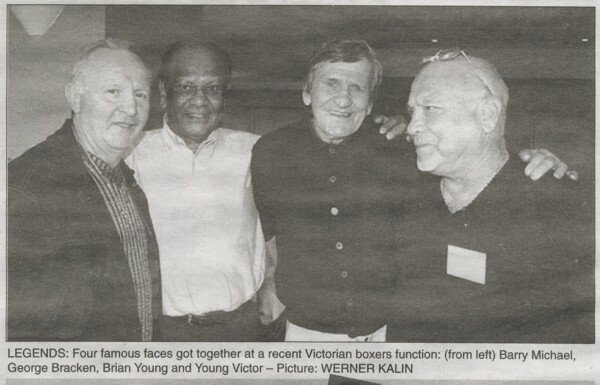 I do thank the World of Boxing for placing this photo in their magazine as I was very much in love with the great Aussie champion George Bracken during our time, Barry, a one time world champion is now a very good friend of mine, also a very nice guy, same goes for Brian Young. I recently noticed that the FIGHTER magazine returned, if not in print form at least you are back on line. This is nice to see and I wish you all the luck. Melbourne then a prelim boy, Young Victor aka Victor Aquilina, won the Most Improved Boxer award of the Victorian Trainers League . . in 1960. Forty-four years tick by. At the Trainers' end of year 2004 awards afternoon, Port Melbourne light-heavy prospect, Jonny Walker is voted Most Improved. Fittingly, Jon collects the Young Victor Award from a young-at-heart Aquilina. 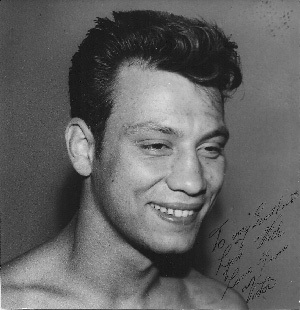 by Mike Ryan Fighter Magazine legend. for 41 years , my older son Paul and me "my Aquilina family"
from St. Kilda marina to Paterson Lakes. 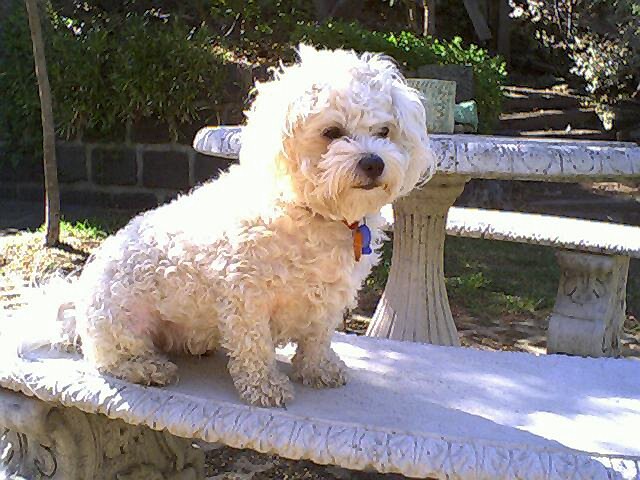 Bridget in the front garden, this is one lovely doggy.